Dell announced their XPS One model and I’m a little shocked that the prices are so high. The sticker shock is reduced as you get in to their higher-end models, but for some reason they all only have a 20 inch screen. You can’t go any larger. They’ve obviously tried to model their new line after the iMac, but all they’re going to do is impress people who have never seen an Apple iMac before (especially the new models released earlier this year). I would have thought that a company like Dell would really shake things up with some aggressive pricing, but that just isn’t the case. 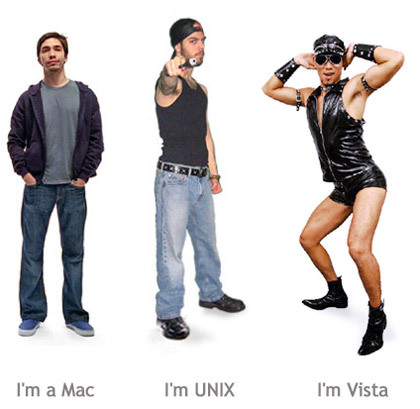 Another thing they have going against them is that Vista appears to be the only OS they’ll install. It seems that that their recent back-tracking to offering XP and their recent option of Linux would have led to choices for consumers, but … nope. It’s a very interesting time indeed. Rob Howard, formerly of Microsoft, recently announced that he bought a fifteen inch MacBook Pro to use as his only laptop. This came after Scott Guthrie, currently a General Manager at Microsoft, recently mentioned the pricing of a MacBook Pro in his blog when talking about what hardware helps with performance. Two years ago I would have been blogging about how Macs are all but extinct and how people who need to get actual work done should be on Dell or IBM hardware running Windows. Now look at me. My, oh my, how things change! At the suggestion of my buddy Brad, I set up a Windows machine under VMWare Fusion (as opposed to Parallels, which is what I’ve used up until now). I am absolutely amazed. From the time I pointed VMWare’s virtual machine setup dialog to my Windows install media it took a mere 11 minutes to create the VM, install Windows XP Pro, reboot, install the VMWare drivers, and reboot again. The machine was completely ready to go in 11 minutes. So far, the machine seems *really* rock solid and responsible. Wow. Beat that with a stick. I’ve done video chats with people using iChat on Tiger and it’s been mostly great. But I had never done a video *conference* chat, where you can video chat with two or more people at the same time until this morning when I tried it on iChat for Leopard. I did a video chat with three other people, and the way iChat was able to handle it without a hiccup was pretty amazing. The UI is very impressive and the way you can still share photos and files and they way there is no lag when people are talking just puts it light years in front of anything else I’ve ever tried. Jeff, Jeff, Jeff. I pay 99 cents for a song on iTunes. Usually twelve songs make a CD. That’s a hair shy of $12 if I buy them one song at a time, or $9.99 if I buy the whole album on iTunes at once. Oh, I know! That must be because Amazon charges $9.99 for lots of today’s popular CDs. I just happened to go to the iTunes music store first and clicked on one of the albums in the “New Releases” section of music. Then I looked up that same album on Amazon. Same exact price. I know this is just one example. So let’s take another one. Neil Young’s album sells for $10.99 on iTunes Music Store. It’s $11.99 on Amazon. $1 more. Now think about the printing, pressing, packaging, shipping, and manual labor it takes to get the physical CD created and into your hands. What do you think? Is a buck probably a reasonable price for all that? I think it is. Jeff, your comments indicate to me (and for all I know, others) that you are one of the people who are unwilling to truly accept change. And this type of change is something that has been coming for literally YEARS. Everyone has had YEARS to position themselves for profitability in this new digital business model. You obviously failed, because you’re throwing tantrums and telling lies and working AGAINST consumers (your customers, I might add) and trying desperately to cling to a business model that has become outdated. Maybe it’s time for Jeff to get a new job. One where there’s a lot less responsibility and a lot fewer key decisions to be made. I know that sounds harsh, but in today’s world – an entertainment company whining about *more* distribution via electronic means and *lower* COGS. Please. What's the Deal with Zucker? I read some quotes by Jeffrey Zucker, the president and CEO of NBC, regarding their deal to sell TV shows on iTunes and frankly I was just absolutely floored. Is this guy for real? How does someone with his level of short-sightedness rise to such a high position? Two of the things Zucker said, I think, are quite indicative of insanity. First, Zucker indicated that he was upset that Apple wasn’t sharing the revenues from hardware sales – hardware that people would use to watch shows purchased from the iTunes Music Store. This seems like lunacy to me. Panasonic didn’t have to give some of the money I paid for my TV to NBC (or any other network, for that matter). Sony didn’t have to pay money to any studio when I bought my DVD player. And TiVo doesn’t have to give any of my money to the networks when I record shows and watch them later (skipping through all the commercials). Jeff. What are you smoking? Second, Zucker said that NBC only made $15 million during the last year of their deal with Apple. Only fifteen MILLION dollars. Zucker followed up saying that he didn’t want to replace “dollars” in the analog world with “pennies” in the digital world. I think he’s just nuts. There WAS no paying digital world to speak of before Apple came along and did what they did with the iTunes Music Store. And it doesn’t even matter that it was Apple that did it. Microsoft could have done it, some third party could have done it – it just doesn’t matter. I would like to point out that this is NEW revenue. There was simply no way for a truly “average Joe” to legally buy an episode of a television show, download it, and watch it on their computer, phone, iPod, or TV. And poor NBC *only* made $15 million from this. On TOP of what they normally make for their shows to air them on broadcast, cable, and satellite. Zucker: You need to wake up, man. You are shooting yourself in the foot. Actually, with digital distribution going the direction it is, you’re shooting yourself in the chest. I read the article below and while I don’t necessarily share ALL of the writer’s expectations with regard to Leopard over Vista or Apple over Microsoft, he does indicate that Leopard will embarrass Microsoft (and specifically, Vista). I blogged recently about how I don’t believe Microsoft has to fail in order for Apple to win. Apple is already winning (just look at their products and look at their stock price – clearly a winning company). I’m not sure if the author of the article below feels the same way, but when he said that Leopard would embarrass Microsoft, I don’t agree. I think *Microsoft embarrassed itself* when it released Vista. There are those who will say that Microsoft has sold 88 million copies of Vista and how huge those numbers are and how that makes Vista a success. But when I hear people say that, I think about how Microsoft forced Netscape and other browsers out of the market based on questionable business practices and loads of anti-trust cases and I really start to wonder what makes up that 88 million. Clearly people are buying new computers at record rates. So that’s got something to do with the 88 million number, particularly when you stop to think about how Microsoft would not allow OEMs to ship a computer with anything BUT Vista. That was overturned, and now vendors like Dell will sell you a computer with XP, but it doesn’t take away from the point: Vista sold a lot of copies because vendors simply were not allowed to sell a computer with any other operating system (servers aside). Is this reminiscent of those old practices that got Microsoft in to so much trouble with the law? Who knows. But it’s one point that starts to make ME wonder. I bought the family pack of Leopard this evening and only had to wait on line about 25 minutes. There were about 200 people ahead of me, but somehow they were able to move those people through the store very quickly. Interesting thing to note was that when I had made my way up through 75% of the line, I looked back and the back of the line was at the same point at which I started. This blog entry is called “First Impressions”, and with that in mind, I will keep this very short and say three things. 1. I had hoped that doing an upgrade on my Mac Pro from Tiger to Leopard would be sweet. When I was a Windows user, I had upgraded time and time again, through virtually all versions of Windows, and each time the system was extremely sluggish and very disappointing in performance. I therefore formed the opinion that no one with any kind of technical know-how should EVER do an upgrade of their operating system. It’s just too big of a deal. I was of the frame of mind that whenever you were going to install a new OS, you needed to reformat your drive and start from scratch. Apple wasn’t able to sway me from that opinion. While my Mac Pro performs acceptably, it most certainly doesn’t perform like a quad-core 3.0 GHz system with 5 gigs of RAM. I will therefore be doing a reformat and reinstall on this box as soon as I have the time. Meanwhile, I will enjoy the GREAT features of Leopard, such as Spaces (discussed in item 3). 2. A fresh install of Leopard is quite literally amazing. My MacBook Pro (which I think is the first-generation 15″ unit with 2 gigs of RAM) performs (I swear) BETTER under Leopard than it did under Tiger. And that’s something I absolutely NEVER could have said about any Windows OS upgrade. My MacBook Pro is extremely responsive and I’m just loving the experience. This is a far cry from when I first tried out two other major releases this year: Vista and Office 2007. I spent so much time trying to figure out how to do things I already knew how to do that I became very sour on those products and just stopped using them. 3. Spaces is just freakin’ awesome. This concept of having multiple desktops that you can switch between is by no means new to either Mac OS or Windows, but in Mac OS the implementation is just SWEET. The performance is amazing, the user experience is nothing short of what you’d expect from Apple, and I’ve already found Spaces super-useful even though I’ve only had it installed for a couple of hours. I plan to get in to Time Machine when I get a new external hard drive. I’ll also blog about various other Leopard findings. But I feel it is important to make one final point. I first installed Vista Beta 2 when I was a devout Microsoft Fan Boy and I was both disappointed and surprised at what the public was to come to expect as the next “major release” of Windows. Similarly, I installed Leopard as a devout Apple Fan Boy almost two years later and contrary to my Vista experience, Leopard feels like an extension of all the goodness, reliability, and strength that I already had at my disposal in Tiger – not a replacement of things merely for the purpose of change.